A few more bird shots can be found on my Flickr set here. I TOTALLY thought that was a fake bird in your Freshly Pressed pic. WOW! Very nice shots. Thank you for sharing, and happy thanksgiving! Which ones make that baby crying sound? I drove me nuts when I went to Africa this summer! Was it the third one? (I do miss that bird sound, makes me laugh in the middle of breakfast). wicked awesome shots…congrats on being Freshly Pressed! They’re all beautiful. I loved the bird in the fountain the best. Very nicely done photos. As an avid birder I thank you. Would be a great trip! These photos are awesome!! Just beautiful! Fabulous, just fabulous. Thanks so much for sharing these. Awesome. These are beautiful pictures! Some almost seem like still lifes, while others are clearly captured moments in time (the bird in the fountain and the flying eagle with the gently bending feathers). I’m coming to love birds more and more. These are simply gorgeous. Thanks for posting them! Wow! Wonderul shots – beautiful birds. Wow! You got all my fave birds there. Only one not tere is the Carmine Bee-eater. It’s also a stunner. Your shots are fantastic. Beautiful shots! We have many lovely birds here in Florida but they aren’t as colorful as the shots you took. Magical and amazing. Thanks for sharing. Absolutely love the photo of the owl and the bird taking a bath – love bird photos:) Thanks for sharing and Congrats on being FP! Really beautiful photos great work! Hey great bird shots! Kruger is such a beautiful place to visit. I miss that country. Nice job on bringing back old memories of these birds. stunning photos! reminds me how precious our planet is. I hope these birds remain safe and flourish. I am a bird lover so I think your photographs are amazingly beautiful and poetic. I am having one of those “wish I was there” moments. Congrats on the Fresh Pressing! Wow gorgeous pictures. What camera were you using? such beautiful species! Thanks so much for capturing and sharing these nice shots! It’s the first time I’ve seen a starling that looks good. Nice photos. On the night before Thanksgiving it was strange to see bird relatives of the turkey looking so colorful, alluring and beautiful. Wow, just wow! Thanks for sharing your talent, and the gorgeous photos of the birds. What bought you to South Africa? Amazing, that barbet is incredible! 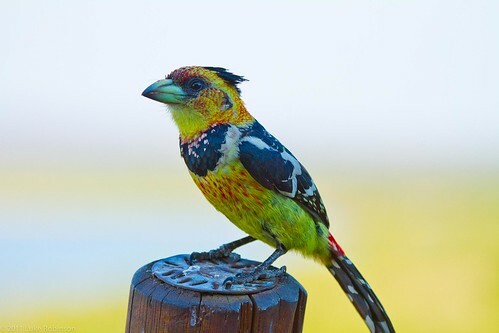 Wow, great photos, that crested barbet is spectacular. Thanks everyone for all the comments, compliments and notes. It’s great to see so much positive feedback! OMG this is brilliant!!!! I loved the pictures!!!! Great Job!! Such vivid colours. Which camera did you use? Mite this is awesome pics. 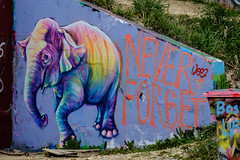 follow my blog to get great pictures of worlds best places and art photography. I love the Heron. Is that a croc behind it in the water? Amazing birds, the Crested Barbet is such a beauty! Amazing photos, combining wonderful action shots of birds in flight and the resplendent colours standing out on the stationery ones. Wonderful shots of incredibly beautiful birds! My fav is the Lilac Breasted Roller – something tiny, but beautiful! Excellent work! Well done! There are must be endangered species that must be preserved. oh gosh this is GREAT photography!!!!!!! What camera do you use? Wow, amazing pictures and very cool birds! Thanks for sharing and congrats on being freshly pressed! Those are such a beautiful places and birds. I am dreaming of visiting South Africa in person one day! Thank you for sharing! I was totally swept away with these beautiful shots! Amazing creatures, vivd colors, so full of life! Can I grab some of these photos to use for an online education site, if you don’t mind? of course, I’d like an approval first 🙂 thanks! Beautifully done. Congrats on being FP’d. Some beautiful pictures and amazing colours. Love the crested barbet. What awesome photos! They bring back wonderful memories of my time there of a few years ago. One of the most amazing moments was when our Zimbabwean guide took us to a watering hole at dusk and we sat there riveted watching a group of hippos glide silently through the water – unforgettable! I was on a professional wine trip to South Africa and this was a fantastic add-on to our trip. Thanks for sharing this video clip…that is by far one of the most amazing bits of footage showing a battle for survival…not at all what your comment said…I didn’t see any hippos. Lion against Buffalo with an intermezzo of crocodile (@3:44-4:12)…fascinating. This was riveting…it ends better than you might think…worth the watch. These bird shots are stunning! COol photos.. Makes me drool to get me one of those expensive fast zoom lenses. Lovely pictures. My personal favourite is the Scops Owl. 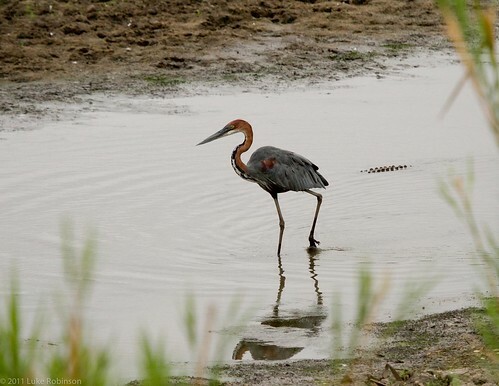 That Goliath Heron is about to become lunch for a crocodile. Love the prehistoric looking hornbill. Get that scorpion! You have some excellent shots here! 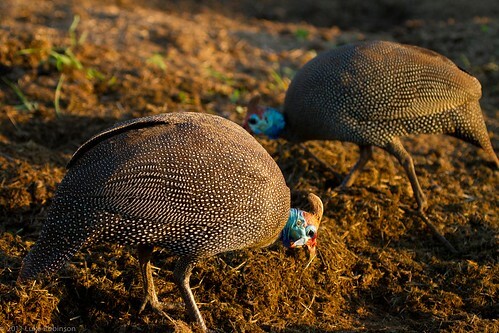 I recognize some of the birds from my own trip to Kruger. Very nice. Beautiful bird pics, quite extraordinary! Brilliant colours. Sweet Pics! Have not yet been to S. Africa but now we definitely have to. Great pix, but wow – that crested barbet is amazing!! All those colours! My parents used to take us camping in Kruger. Your pictures are beautiful and bring back good memories of my parents pouring over bird books, my Dad trying to help me identify birds and my big family fighting over the two pairs of binoculars we had! 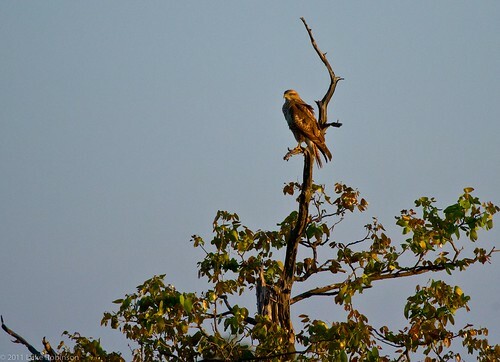 The best bird sighting we had was a pair of Fish Eagles mating. Spectacular! Great collection of photos. Nature sure can mix and match any color and get away with it!!! Thanks for sharing. That owl is majestic, if it’s eyes were closed might even be camouflage with the tree. 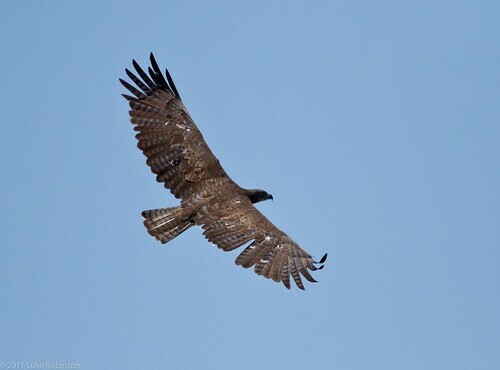 This is amazing, my fav is Cape Glossy Starling, nice shoot.. and the eagle’s awesome !! Wow! From someone who has spent time at both Kruger & the Okavanga Delta in Botswana, I can say that the birds are INCREDIBLY hard to photograph. They are all fantastic and beautifully, and you captured them so well!! (my pictures of the lilac breasted roller are pitiful in comparison). I hope you have enjoyed every minute! The nature there is awe-striking. Absolutely was awed by the Crested Barbet. I have never seen a colorful bird like this. Thanks for the Thanksgiving present. Really fabulous! Fantastic photos. I really enjoy the positions you catch them in. Refreshingly beautiful…feast for the eyes. Incredibly beautiful. Wish I could take pictures like that. Wonder what kind of camera, lens, etc. were used. It’s a real feast for the eyes … thanks for sharing. A real privilege. wow, they are so beautiful and special! thanks for sharing! Happy thanks giving day! Wonderful pics, thanks for sharing them! The bird bath shot is fantastic. amazing pictures the colours in the birds are very nice to look at . So impressive, I have never seen those beautiful and colorful birds at one time. Thanks for sharing, really nice shots. But I think our Philippine Eagle is better! Wow!!!!!!!!!!! Superb, it was beautiful picts of the day for me. Love to explore and share ,free our mind as the wing of them(birds). Let’s fly high as you can do to the world………. Ilove those birds! Incredible photos! Wow! Those pictures are great! Great photos! I so love it. I hope those birds are well taken care of. Beautiful photos! Wow, you were right about the variety! Amazing shots…totally psychedelic colors. Love it! Wonderful! I really love birds and I’ve never seen such beautiful birds! And those colors! Great job! Great photos. Want to go there! Wow amazing bird shots!!! 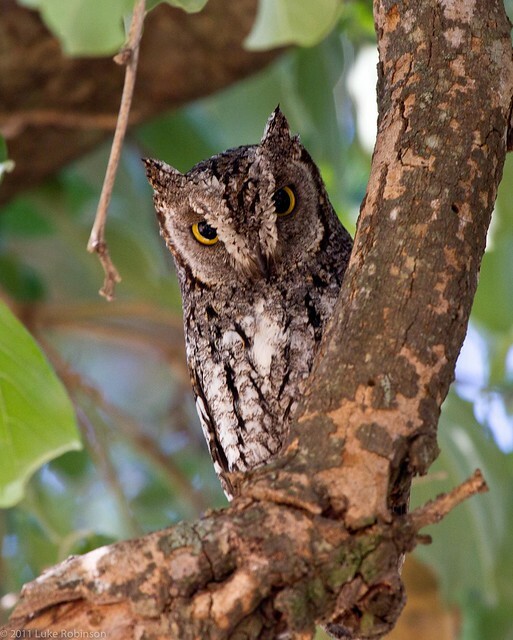 Scops owl – absolute favourite! Wow! It seems to me a beautiful park! And the birds are beautiful, have beautiful colors and strange shapes, but very beautiful to see. Beautiful photos! I’d like to go to Kruger Park. I love birds. These pictures are amazing! As a South African I can happily agree…we have a country filled with awesome wildlife photo opportunities, sometimes even in our own backyards! Nice shots. The owl and the bulbull really capture my heart. Merci! Just lovely. I could look at birds all day. Fantastic photos of the Bulbul and crested Barbet. Outstanding photography! I especially like that magnificent Owl! God bless you & your sites visitors, amen. Wow…great shots…I just love the massive variety of different creatures (especially birds) that there are out there. 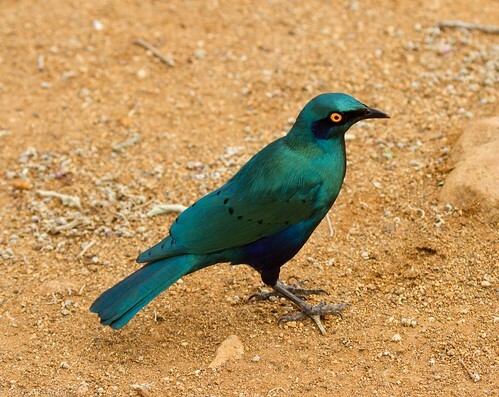 Their Starlings are just a little more glamorous than ours…! I visited South Africa in August and didn’t see that many birds in the parks. I did go to Birds of Eden, near Plettenberg Bay and that was amazing. Lovely photos. I live in Cape Town, I still need to head up to the Kruger sometime! Awesome pics! Love the bird-bath photo! What a snap! Oh my goodness what absolutely beautiful photos!! Thank you so much for sharing them with all of us!!!! What fantastic shots you were able to get. Love, love, love them all!! You captured some wonderful moments! Well done!! Gorgeous photos . Wonderfull place. wow really nice photos. keep traveling. I LOVE the Owl he is so adorable! Very nice shots !!! I love the Owl too !! 😀 Just go on man. Captivating photos! . . . Great resolution! Really feel like I’m “up close and personal” with that owl! 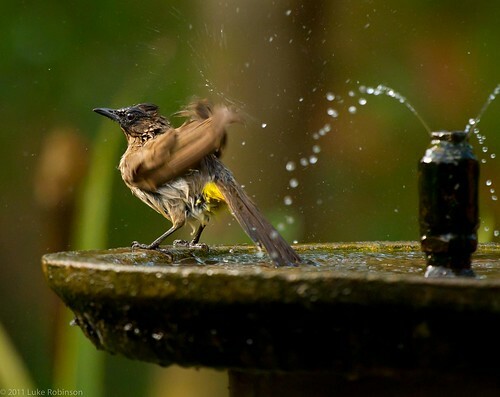 Especially like the picture of the Bulbul taking a bath in the fountain! I love stuff like this, pics, nature shows…so inspiring. Love it. Thanks. Wonderful! Not only did you capture the birds, you also captured their spirits! That starling looks a lot bluer and glossier than the ones that sit in my backyard! 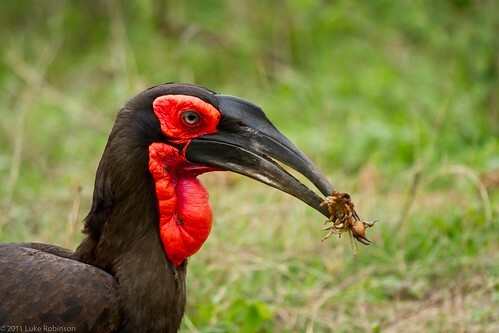 Also, interesting pic of the hornbill–they’re funny looking birds, but kinda cute, too! I love birds, and these are some of the most beautiful that I’ve seen. beautiful birds! Now, those are something I don’t see everyday. Thanks for taking these photos! Like elegant paintings, beautiful shots! these are the most amazing birds i have ever seen.Crested Barbet is the most colorful bird. Wonderful photos. I like the birds bath the most. The level of colour is also very nice. It gives me a heart-warming feeling when I look at it. This is miraculous! So so beautiful it is almost unbelieveable such incredible birds live! As a bird lover and have a Red Vented Bulbul as my baby pet, I’ve never seen such colorful birds like the blue ones. Rare, Nice, Beautiful Pics. Great Photowork there. Aloha! oh my….love love love your photo works for Birds, nice shot and very inspiring me…. Beautiful colorful birds! I love the Crested Barbet. Hoping to see a few of those on my luxury South Africa holiday next year. As you can probably tell from my avatar pix I love birds. These shots are fantastic! Beautiful Gallery! These birds, the colours! Really great post! Inspiring. Wow! You captured the birds in all their glory… the colors are stunning. Thank you for sharing! 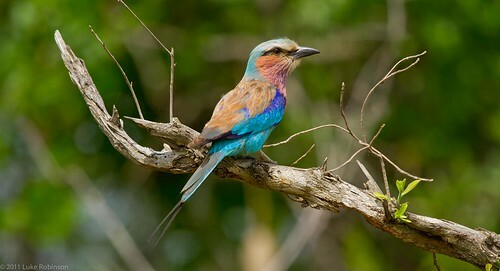 Wow,I never knew there were such a majority of bird species in Kruger. It’s awesome. Did you took a picture of all this birds in one day? I know it’s lame to mention it, but I had three canarias birds .Do you have birds yourself? 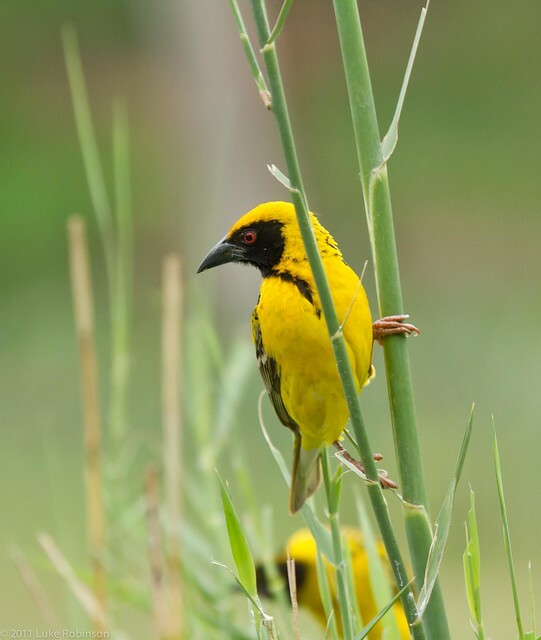 Wonderful post highlighting the diversity of the birds in South Africa. They. Are quite beautiful.. congrats on FP. Wonderful photos. Great shots of the birds up close. Great Owl! Thanks for sharing! some real fine images here, and congrats on being fp’d! Nice shots!!! I liked the first one!!. These guys are really cool. I like birdinhos. 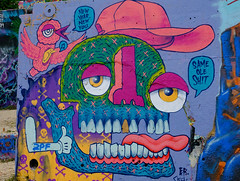 Wher we live the birdinhos are nuts. They fly close to your car when driving. They sit in the middle of the busy street. They fly on our porch. We have a birds nest nestled on the top of the porch. What a wonderful adventure! My husband is from South Africa and is planning on taking me some day to meet the family and see the land. I have friends who have been to visit and say the wildlife there is absolutely amazing. You have captured beautiful pictures of these creatures. Thank you for sharing!